I've had a good read through a number of threads on here and elsewhere and I'm still coming up blank. I have a watson's frame b16a2/S9B clubman which I recently purchased. It's currently running some 13x6 deep dish ultralites... So predictably suffers from copious bump and torque steer mainly due, I think, to the low offset of the wheel. They stick out a mile (6"+) and appear to be way off centre of the ball joints. I want to find a wheel, ideally 13"x6" with a more suitable offset... I've read about VW alloys having favourable offsets but they all apear to be 14" and bigger. I emailed compmotive about producing some 13x6's with a ET49 offset, they said no. I asked what the biggest offset they could provide at 13x6" was and Barry said ET25. I was hoping to change my arches to a 5" miglia arch, or narrower. Oh boy, this is starting to get to be a bit of an issue since Compomotive had issues a few years back. I've spoken to then on several occasions and basically they are not interested unless you are buying wheels that they have in stock or are prepared to order 100 or more ! As far as 13s go there appears to only be one option in the Compomotive calalogue, the ML1357, a 5.5x13 Minilight type wheel only available in ET40. These with a 175 tyre are on the borderline of fitting with Sportspack arches - this is in the assumption that they have these in stock. Beyond that you are looking at OEM Metro wheels for 13s. You may be able to find some Euro fitment wheels in 13 but the PCD will be 4x100, the Watsons frame is 4x3.75 and this is a very rare fitment so you'd be looking at getting the drive flanges and discs re drilled for the bigger PCD. Last edited by Oz; 23-05-2017 at 01:30 PM. If you can move away from the Minilight design I see they do a 5.5x13 TH1355 which can be made in a suitable offset - again, depends on whether they have any in stock. I'm running the Compomotive MO in 6x14 with an ET of 49, a size they no longer offer, now only going to ET45 and these poke slightly outside Sportspack arches with 195/45-14 tyres. Last edited by Oz; 23-05-2017 at 01:45 PM. Appreciate the info & effort Oz, it's looking much more difficult than I had initially imagined. As far as I know, my hubs/flanges have been adapted to the mini PCD of 4"x4 or 101.6x4. Hence the ultralite wheels currently fitted in the pic. Does this make things any easier?? Last edited by Haz; 23-05-2017 at 04:47 PM. Yes, to cure the handling woes with your Watson frame, you must have an offset similar to Rover Metro. As Oz mentioned, go ET 48 / 49 with 6" rims. Last edited by Oz; 23-05-2017 at 06:31 PM. Another email to compo asking about their 5.5x13 ET40 wheel, no response. Lastly I contacted ' Image Wheels' and asked for a quote for some custom rims which came in at £1071 delivered. We should be able to do your offset assuming your callipers do not protrude past the mounting face as dimension D on our drawing. The price will be as follows. Current delivery time 8-9 weeks. So a couple of options there.... My last option appears to be Metro GTi wheels, does anyone know of any hen's teeth stockists? According to that link there is only one of those steel wheels left. Your best bet for Metro wheels is eBay and Metro forums. They may even throw up something different from when a few different rims were made for the Metro fitment. 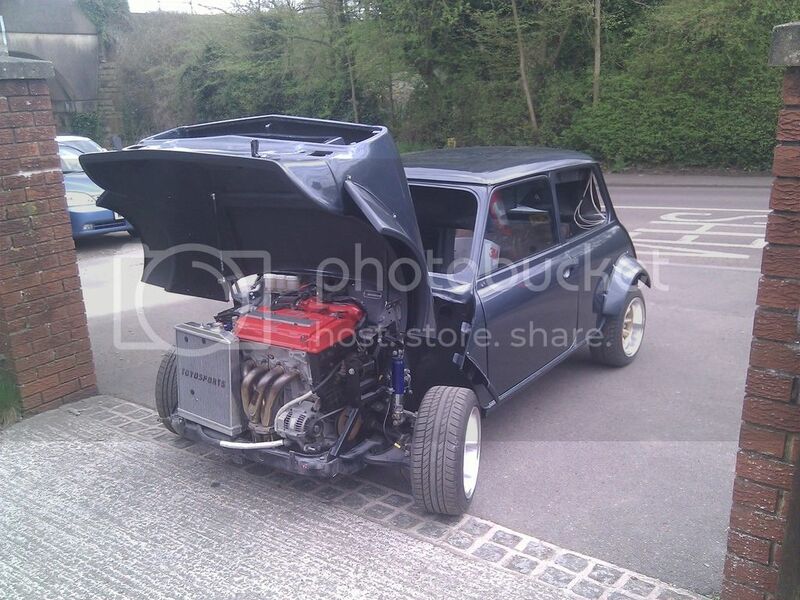 A local guy rallied a Metro with 1600 K series fitted about 5-10 years ago and he was running Revolution RFX wheels so you might come up with something rare. Last edited by Oz; 24-05-2017 at 08:28 AM. The issue with the Image email is that they have wrongly assumed your calipers do not protrude beyond the Mounting face, I believe they stick out about 14mm beyond the mounting face. I've looked at Image before, the issue with them is that the offset we need is so extreme that the cast wheel centre will stick out of the front rim piece. These are 7x14 Image rims and look how tiny the front rim piece is. I don't know what the offset of these are. Appreciate the info once again Oz. You're a fountain of knowledge! I couldn't find what brakes abs was using in that thread, don't suppose you'd know would you? I'd like some kad 4-pots, I used to have a set on my 1380 mini around a decade ago... Going to b16 and back to metro/mini brakes is scary. I may well have to take you up on that offer, regardless of postage. I presume they're 14x6 or 14x5.5? I'm a bit annoyed myself with this Compomotive situation as I was speaking with gazwad about buying his ML1356s when he decided to swap to a Mini based frame but I ended up not getting them as I was going to go for a set of ET44 ones just to help get the wheels a bit further in to be covered by the sportspack arch I have but as I kept getting delayed in sorting out my new subframe I never got around to making the order with Compomotive. Now it turns out Compomotive are not making these anymore so I wish I'd not been so picky and bought gazwads wheels when I had the chance ! The Metro GTi wheels I have are 5.5x13 with and ET of about 52, they will sit well inside your current arches, I believe they fit under standard sportspack arches which are 3.5" wide. They are also 4x3.75 PCD so if your hubs have been adapted to Mini PCD then they wont bolt on. I'm not trying to do myself out of a sale but I also wouldn't want to sell you something that doesn't fit your car. Your best bet at this stage is to measure your PCD - just measure between the centres of two opposite studs (not ones next to each other but the one diagonally opposite), that should tell you what PCD you have then you can start planning what you do from there. There are some 5.5 and 6x13 wheels available for Mini fitment with ETs of around 28-30 which would be a lot better than what you have as another option, you'd just need to speak to the companies (John Brown Wheels and Tech Del Minilites) about the caliper clearances against the spokes. Abs is using the standard Metro GTi/MGF vented discs and calipers AFAIK. Mini based calipers do not fit Metro based frames. The standard vented Metro GTI/MGF set up is pretty good when fitted with decent pads and discs. KAD and Hi-Spec do uprated brakes for the Metro/MGF with 4 pot and I think 6 pot calipers which supposedly fit under 13 inch wheels but I've never tried them - the only thing with them is that they do not have protective boots around the caliper pistons so they accumulate dirt and can cause seal failure, I think they are more targeted towards race cars which are regularly stripped and cleaned. I have the Hi-Spec 4 pot road kit for 14 inch wheels on mine which are complete overkill for my road use - but Jersey does have a max 40mph speed limit so I never get them even warm. I specced the car originally for trackdays but then marriage and kids came along so it's just a road car now I was actually going to convert to the GTi/MGF brakes to fit the MLs. Appreciate your honesty dude! And the info once again!! But after your last post and looking at the pictures I'm thinking these are the same 4x3.75 PCD as your wheels you have for sale. I may have to just settle for some standard 13x6 sportspack alloys at ET21. That's 19mm better than my current wheels... but still 28mm short of where I'd like to be.